In mid-2016, Instagram announced the launch of ‘Instagram Stories’. Despite some minor UX changes, Instagram’s new feature was unashamedly a direct clone of the popular Snapchat feature; ‘Snapchat Stories’. At a press conference following the release of ‘Instagram Stories’, Instagram founder Kevin Systrom openly admitted that his team copied Snapchat; “Totally. They deserve all the credit.” was Systrom’s response when quizzed by a reporter. While some Snapchat employees took their frustrations to Twitter, the photo sharing app initially declined to issue an official response to the blatant rip-off. While Snapchat made no official statement regarding ‘Instagram Stories’, the team was clearly irritated when just last week, Facebook announced it’s latest feature. Yes, you guessed it - ‘Facebook Stories’. On March 28, Facebook announced that they too would be implementing the Snapchat clone into the Facebook app. In what is likely an April Fool’s Day joke, Snapchat’s latest filter pokes fun at the seeming lack of originality coming from the Facebook/Instagram teams in recent months. 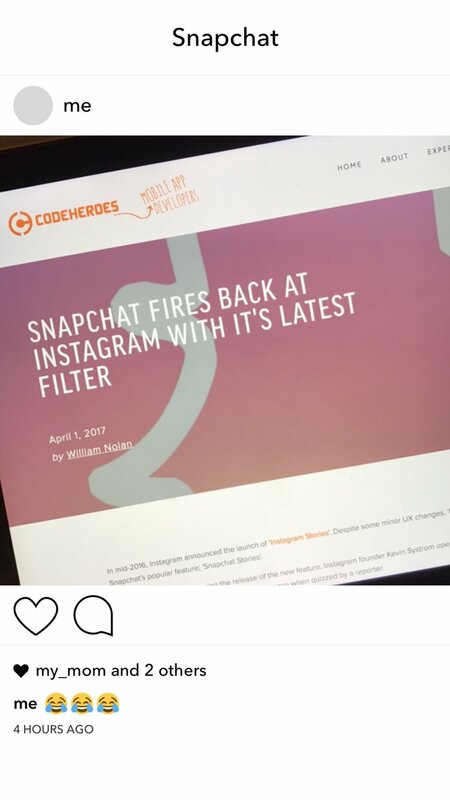 The Snapchat filter takes direct aim at Instagram by copying the photo sharing apps familiar user interface. As statistics indicate, the release of ‘Instagram Stories’ caused a significant decline in Snapchat’s growth and usage, as such, it will be interesting to see what affect ‘Facebook Stories’ has on the popular ephemeral app. Until then, I think it’s safe to say that Snapchat won April Fool’s this year.